(W) Mathieu Missoffe (A/C) Charlie Adlard From the New York Times Bestselling artist of the Walking Dead hit series comes another horror classic! July 1917. The night air is rent by sentries' screams. Everyone thinks it's a trap laid by the enemy, but soon they hear screams from the German lines. Both camps are obliged to declare a truce and send a team of men, French and German, to solve the mystery. With them goes Wohati, a Red-skin, one of the 12,000 Indians in the U.S. Army. And probably the only man who knows what's out there, lying in wait. Illustrated by Charlie Adlard (The Walking Dead), this is the story of a strange phenomenon to strike the French and German trenches. 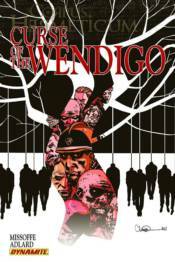 Their only chance: to unite, and survive, the Wendigo!